Samsung is really doing some pretty awesome things with their phablet line. Previously, we’ve shared more details about the Samsung Galaxy Note 2’s Smart Rotation function. Today, let’s take a look at one of its other cool feature — Multi Windows. The Samsung Galaxy Note 2’s Multi Window feature takes advantage of the unit’s generous screen size and allows users to run two apps side-by-side simultaneously, turning the device into a multitasker’s dream. In case you wanted to maximize the feature and are wondering which of your apps are supported by it, the guys at the XDA Developers forumshave started compiling a nifty little list. Started by a user named “Lennyuk,” the list is broken down into three categories — Samsung apps, Google apps and third-party apps. Lennyuk also suggests that you use the Samsung stock keyboard when you activate the Multi Window feature, otherwise you may end up blocking the bottom of the screen. Android Authority reports that the feature was not initially available to international users of the device but Samsung has now quickly taken steps to address this by pushing out a firmware update. And it’s a good thing too because those without the fueature would be missing out on one of the best reasons to own a Samsung Galaxy Note 2. 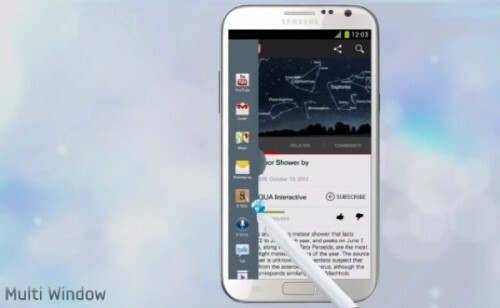 Have you tried the Samsung Galaxy Note 2’s Multi Windows feature? Have you discovered any other apps that work well with it? Add to the list by letting your fellow Tapscapers know in the comments below!